The Life of Christos, Prophet, Messiah and Founder of the Aristotelian Church. Translated by Venerable Wheeler, Mother Arynna, and the members of the Ordre of Saint Jérôme and released unto the English speaking faithful, May 1455. Here, my brothers, is the heritage that I pass on to you, in the form of these scrolls of parchment. I, Samoht, an old man who hopes soon to be recalled by The Most High to join Him in His Kingdom, have consigned here all my memories of the one named as Joshua but called Christos, who marked the world indelibly with the print of his foot. You know of him, my dear children, this thin, beautiful, great man who traversed the deserts, stick in his hand, radiating a divine happiness. 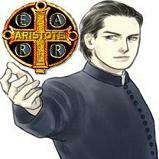 He taught the message of Aristotle to all men to save them from their own iniquities. He was the much-awaited Messiah, our so much hoped-for guide. You know him, you who already heard so many testimonies about his life, sometimes divergent, often mysterious, but all agreeing on the exceptional destiny of this man inhabited by God. Now, my strength has left me, my friends, and I feel that I might not last the winter. So, I purposed to tell you his history as much as I lived it, a long time ago. I worked like a slave, through the night, by the gleam of a candle. I dug deep into my memories to make certain that everything written here is true and accurate, and removed every thought that time had changed or embellished. And yet, even after taking these precautions, his life seems to me like a mirage, a dazzling dream, a mystery of exciting beauty and melancholic drama. Alas, today, bowing low even when standing upright, adorning myself with my cane, when I finally rise on my frail legs to admire the beauty of creation, I cannot prevent myself from choking a sob; the sunlight of this day appears still impressed, body and soul, with Christos. Nature also testifies to the power and kindness of The Most High. As for life, it is in itself a proof of this so disconcerting transcendence. My tears of joy are intended for God, as thanks for having created us and for the enormous gift that He gave us by sending the Messiah to show us the way. I can also, my brothers, now cry in happiness for reading these lines, proof that I have not failed in the mission which Christos himself gave to me so many decades ago. When I knew Christos, he liked to speak to us for hours on end, with a voice impassioned and enthralling. We drank in his words with enthusiasm and nourished our hearts with them. It was at the time of one of these long discussions that Christos told us of his childhood. Thus, I report it to you, my children, because this part of his life was as beautiful as that which I lived through at his side. The rider then set out again, back toward the remote region he had come from. Maria awoke at this time and saw Joseph in front of her, looking at her with eyes of love. And it occurred as the dream had announced. Maria delivered a child, and all occurred according to the prophecy of Aristotle, his parents naming him Joshua. The child was born in Bethlehem, in Judea. Because of the overpopulation that existed in this city, the couple found only one dilapidated shack in which to rest, for there was no place to accommodate them elsewhere. But when the child was born, he seemed, to all those who saw him, touched by divine grace, because he radiated gentleness and calm. So the people of the small village made donations so that this blessed child of God should have all that was necessary for him. Some brought linens, others helped to repair the shack, and still others brought food and clothing to the two happy parents. Maria was transfigured by happiness. Her joy made her luminous and she thanked The Most High each day thereafter for the birth of this child. Maria was too happy to be the mother of him who was going to become the Messiah to hold her tongue. One day, when she was going to seek water at the fountain, she crossed paths with a courtesan of the King of Judea called Elitobias. Then Elitobias, who believed in dreams and in the signs of destiny, was disturbed. She returned hastily to the palace of Mistral IV to warn her Master. Mistral IV was a man like marble, a statue polished by the patina of time. He was dark, a widower, inconsolable in his sadness and distant from all. As a prince, he had fought off the Medians thanks to an astute system of pulleys and carts. But his glory had since become quite pale, and he had become a quiet and detached king of miseries to his people. Jealous of his power, he claimed to direct his subjects but left in fact his intriguing wife to control the kingdom. He never left the luxury of his palace anymore, except to repress a plot or to put down an uprising. Elitobias continued her speech of denunciation then, hoping to thus earn for herself a reward from this coldly attractive King. Then, the guard of the king was escorted out, and journeyed towards Bethlehem. Then, the parents rose, took from their shack the loaves of bread and ears of corn which remained to them and left on the roads, heading north, while passing by Tarotshé. They left the borders of the country and remained in Cyprus for as long as the threat thundered. Then, the famous armies of Mistral, those whom he was able to assemble in only a few hours, were off moving, combing all the countryside. They surveyed each market, each restaurant, leaving messages in which they asked the population to bring to the authorities all the children of less than two years, to count them, so they said. And the common people, innocently, brought their children or their grandchildren to the authorities without realizing the drama that was playing out. Tears were shed and cries of anguish were heard, and one saw blood, sweat and tears. These guards, which were dreadful, dirty and malicious, cut the throats of these young innocent souls in front of the eyes of their own parents. And the dark one, from the top of his throne, silently looked at the massacre, cold and distant. After this crisis, the king fell down in his silence, lethargic, so that he forgot, in later years, to feed and lost strength. He became weak, then skeletal, and finally died. In Cyprus, Joshua’ parents learned of Mistral’s death and thought that the child’s life was no longer threatened. Then, Joseph and Maria decided to return to Judea, however, they chose not to call their son Joshua but Christos, to not draw attention to him. They took from their shack the loaves of bread and corn ears that remained to them and left on the roads heading south, while passing by Tarotshé. They arrived finally in a city called Nazareth, again fulfilling the prophecy of Aristotle. Christos thus passed his childhood in the village of Nazareth where he was raised by his father, Joseph (a carpenter) and his mother, Maria. As Christos was an exemplary child and full of love, he was liked by all in the vicinity. Also, a woman, surpassing all others in benevolence, offered a small kitchen garden to the couple. Thus, while Joseph was going to cut wood in the neighbouring forest, Maria cultivated vegetables. This healthy food seemed to work wonders on Christos, who, throughout his childhood, showed an extraordinary charisma for so young a child. His words were of gold and, when he spoke, all listened to him with attention, without daring to interrupt. And Maria, who continued her vegetable harvests, could soon afford to buy a small meadow where some sheep could graze peacefully. In their turn, Joseph and Maria taught their child the principles of virtue. Christos showed in this field an extraordinary receptivity. He did not only understand these precepts: he lived them fully. He breathed virtue and all the inhabitants of the village were inspired by his example. Christos loved to walk in the countryside and the deserts, to spend time in the middle of nature, admiring the beauty of creation. He parted high grasses, and stood in the dust of the dunes. He walked the paths, climbed the mountains and contemplated the world, admiring its harmony and the fitting of its elements. Perhaps even then he thought of the primary causes of all this beauty? Thus he passed his childhood, and grew, surrounded by people whom he loved. Having reached the age of manhood, Christos decided to leave his parents so as to traverse the world and help its people. He left home with mature ideas on the precepts of Aristotle and the message of God. Having bid his parents farewell, he ventured out into the country of Judea. He went on precipitous paths, climbed mountains, descended into plains, and crossed rivers. During his travels, he met many people, often dressed in rags, who sought in travel and in meditation a means of arriving at a fuller truth. Christos stopped to talk with many of these people, growing rich by their experiences and their humanity. But he saw also the eccentric and the extravagant, the insane and the recluses. In short, he saw a number of vagrants refusing, due to a hatred of mankind, the company and the life of the City. Then, he tried to approach these human poor; he spoke to them and explained the philosophy of Aristotle and the lesson of The Most High to them. His force of persuasion was such that all those who crossed his path were convinced. And, after having spoken with Christos, they returned to their cities and caused among townsmen surprise and joy. But Christos felt in himself the need to withdraw for a time to collect himself. So, he was isolated from the world while walking in the desert. His spiritual retreat lasted for forty days. It was the creature without a name, it that had lived in the darkness for millennia. It did not want that, through Christos, word of the love of God would be spread. It had decided to corrupt Christos in order to divert him from his righteous mission. If the roots of the tree blackened, then it would never bear fruits. And the temptation to rest was dissipated at that moment. And indeed, soon, the image of the oasis was dissipated, leaving Christos seeing only the desert extending to the horizon. At once, the creature without name, that had crawled at Joshua’s side, disappeared, leaving him alone at the edge of the desert. He had crossed this country of temptations in forty days. In those times, the world was in crisis. Many pagan religions abounded. Also, certain men had forgotten the precepts of Aristotle and worshiped false idols. Others, gathered in a powerful Church, claimed they followed Aristotle but had diverted his message or failed to comprehend it. Fortunately, there were still people who lived in the virtue such as it was taught by our first prophet. It should be known, my children, that neither the powerful Church of which I spoke to you, nor the worship of idols, answered the multitude’s thirst for the divine. Thus, the inhabitants of the country of Judea lived in a state of permanent sin and diverted more and more their eyes from the transcendence of the Almighty. There were still some people who tried to gather men of goodwill, but the majority wallowed in indecent assault and fornication. This life of pleasure added to the preference of the people for individualism rather than for communion and communication. Many lost souls wanted to turn to their spiritual guide, the highest priest of the country, the chief of all the priests, but this one remained silent before them. Several people listened to his speech. Two of them, a craftsman and his apprentice, were struck by the accuracy of his words. These were Titus, and your servant, Samoht. We joined a large crowd, all on the way to the large basilica in which the chief of all the priests resided. The man was deep asleep before an amazed assembly that watched for the least movement of eyelid or nostrils, awaiting the ceremony he was to have performed. Ah, I would always remember this day, my friends. After we left the Basilica, we found ourselves face to face with a group of idlers who declaimed sharply one against the other. We tried to restrain Christos, but he did not listen to us and approached this group of quarrelers. He readily understood the cause of the conflict before him; a sheep was lost, terrorized by the cries which came from all sides. On his left were followers of the pagan religions, their priest at the head, holding in his hand a long knife. On the other side stood some who were disappointed by paganism and who, somewhat less diverted from the precepts of Aristotle than the first, had massed to denounce the barbarian sacrifice which was being prepared in the honor of the false gods. Each camp howled with vehemence against the other. Then, Christos called out, calmly, to the terrorized animal, which advanced submissively towards him. Christos cherished it, then told it to go on its way. The sheep left then. But the pagan priest was filled with rage against Christos and advanced toward him, knife raised in the air. At this point in time we interposed ourselves between them, Titus, Paulos, and myself, joined soon by nine others of these disappointed which had been assembled on the right. But Christos advanced and faced the priest alone. This one gazed sternly into the eyes of the Messiah, blanched, and left without a word, the crowd of pagans following with an air of embarrassment. I looked to the nine which did not yet know Christos, who seemed as a group to be divided between joy and distress. And they asked of the Messiah what it was necessary to do to join him. Ah, my children, Christos then illuminated us! His words remain engraved in my memory. We attentively listened to what he said, having the intuition that this day was decisive for our future lives. And the nine others that had interposed themselves remained still, mouths gaping in front of such an amount of truth and accuracy, in front of such a man. And he said, further: “If your family does not understand you, pray for them, because they are not sensitive to the message of God. If one engages you and attempts to initiate a struggle, do not be upset with him, and pray for him, because he is not sensitive to the message of God. If your friends restrain you, then involve them with you, so that they discover also the message of God. The road will be long and torturous, the rough way, the remote horizon, the strong slope, but the sun that shines above will guide our steps. We will have problems, arguments, anger, passions, hesitations, but love and friendship will link us, and God Himself will support us. If you want to live alone, to go wherever you wish, to eat and reason however you will, then nothing prevents you. Go your way and take refuge in the love of yourself. But if somebody strikes you, and you fall, then nobody will be there to assist you. And we, his friends, listened to and approved Christos. We were from now on twelve to follow him. The six women were named Calandra, Adonia, Helene, Kyrène, Ophelia and Uriana. The six men were Daju, Thanos, Paulos, Nikolos, Titus, and Samoht, your servant. And it was in this manner, going from village to village, that Christos spread the good news to the crowds that would assemble. Each time, people were struck by the accuracy and power of his words, so that the fame of Christos the Galilean spread itself in the farthest reaches of the Earth, and the crowds came in increasing numbers to the places where Christos spoke. On the way, he met with many of the sick and the disabled, and we saw extraordinary things then: it was enough that Christos should touch a leprous or blind man that his disability would disappear. The sick felt alive again at his approach, and full of new hope. The mute began speaking, the deaf persons to hear, the blind men to see, the paralysed to walk, and all then blessed Christos and The Most High, praising them and thanking them with all their heart. We did not have any water for the poor fellow, but Christos said to us: “It is not serious, he will simply have to drink from my hands. ” And, in fact, Christos knelt, joined his hands to make of them a kind of cup, and brought them toward the lips of the unhappy one. Then, an incredible miracle occurred, and the hands of Christos filled with water for the man to drink. He having then been refreshed, we hoisted him onto our shoulders and took him to the village where he lived. We approached Jerusalem, the large crawling city of a cosmopolitan and rich population of people. We reached this large and beautiful city on a splendid day. I still see the sun beaming in my head, the soft light that my eyes would barely be able to see today. My spirit keeps this memory in a deep place. We passed by the gates to venture into the middle of the city, coming to a great place swarming with activity. Indeed, this was where goods were exchanged, where multiple vendors sold fruits, vegetables, pieces of wood, or even items of clothing such as shoes, belts, and hats. A deafening noise reigned in this place. And yet, when Christos went up to the central fountain and addressed himself to the population, everyone fell silent and soon heard nothing other than his clear and soft voice floating in the silence. Then everyone was amazed, and the news was spread in the entire city that Christos, announced by Aristotle, had finally arrived. Consequently, all those who had in them an unspecified trace of humanity and divinity, all those which had for a long time felt unease toward the head of the pagan worships, all these left their trades and sought to join the Messiah on the place to hear him speak. So, then, at the end of a half hour, the streets were encumbered with the passers-by, one could not manage to circulate in the middle of the city while, yet, the edges were deserted. A passer-by could spend an hour to traverse a way that it spent five minutes to survey in the middle of the night, or in the little attended hours. And the guards had the greatest difficulty managing the problem. But they were not all so, my children… ah, if you had seen that! If you had seen the taverns being emptied, this disorder being settled! Your youthful rebellion would have made you love this man who defied the established order! Imagine, my dear friends, all the abandoned activities? The paralysed city, the blocked economy? And all the city was pressed around Christos. And he continued to speak, so quietly that it seemed remarkable that he could even be heard. But not a word of his was lost to the least of that multitude. And he turned to the other apostles, who grimaced and pouted, saying: “And you, look at yourselves, here you forget the virtue and become jealous! To belong to this community, faithful to God, it will be necessary to hold yourselves in purity and avoid sin. However, I see well that none among you can claim to such a level of virtue. Turn then toward God, my brothers, for He is merciful and the occasion remains for you to wash away your faults and to follow the way that I show you. Finally, Christos judged that the crowd had heard enough for the time being and he dispersed them. When the crowd dissipated, the place was emptied, leaving room for the guards of the Roman procurator who controlled the city. It was then, my friends, that I experienced one of the major fears of my life; the soldiers, dressed in blood red, converged suddenly on the place, seeming to come from all directions at once. Some emerged on the walls and others left various buildings, blocking all the exits and all the doors. A powerful orator then descended the steps from the palace of the governor, accompanied by a robust centurion. We others, his apostles, were paralyzed by fear. We did not hear the whistle of the breeze that rustled the capes of the Romans. And we watched, anxiously, for the reaction of Christos. Daju was terrified, he who had been most upset not to be chosen by Christos to build his Church. Then, the powerful orator ordered the centurion to seize Joshua, and the officer, with a ferocious expression, approached us with a slow step. I breathed at the rate and in the rhythm of his steps, trying to calm my heart, which beat at a panicked rate. When he was face to face with Christos, the Centurion looked him in the eyes, intensely and rather lengthily. Then, suddenly, he removed his helmet and knelt by our Messiah, clutching the hem of his robe. It was one of the most intense days of my life, and one which I never forgot, so much it is engraved in my memory. Our emotion was at its highest pitch when we realized that the soldiers had deserted the place. But Christos, contrary to us, almost seemed to reach the divine perfection; he felt the divine existence with so great a store of faith that no miracle seemed to be impossible for him. Thus, after the mysterious departure of the Roman soldiers, which, today, I realize must have quite simply left to seek reinforcements, Christos guided us toward a large, richly furnished house and a middle-class woman who there sold food, drink and lodging. He had decided that we would be established there in that place until the following day. However, when the daughter of our hosts came with a jug of wine to serve to us as well as bread, Christos recognized her. It was Natchiachia, who had addressed him previously, at the night’s crowd of listeners. Then Christos answered him, calmly: “Verily I say it to you; I hold the command because I am the most capable to guide you. Along the entire way that we traversed, I have been like a father, one who took care of you. But the result is tiredness and labor, not exalted status. My role is difficult and abrasive… I become exhausted because I carry the weight of the suffering of all men. After this episode, Christos spoke to us a long time about his Church, the way in which he wanted it, with a head and branches, a living body. And the whole resting on a solid basis; people of belief. I took note, in addition, of all his recommendations, my friends: these are those that Titus and other disciples taught and dispersed widely after having implemented them.